Strawberry Coffee Cake is delicious, moist, sweet and tangy breakfast or snack cake, but very satisfying dessert, too! Layer of sweet and refreshing homemade strawberry sauce makes this coffee cake perfect spring and summer treat. For lemon lovers, I suggest lemon version of this coffee cake- Lemon Coffee Cake with homemade lemon curd. 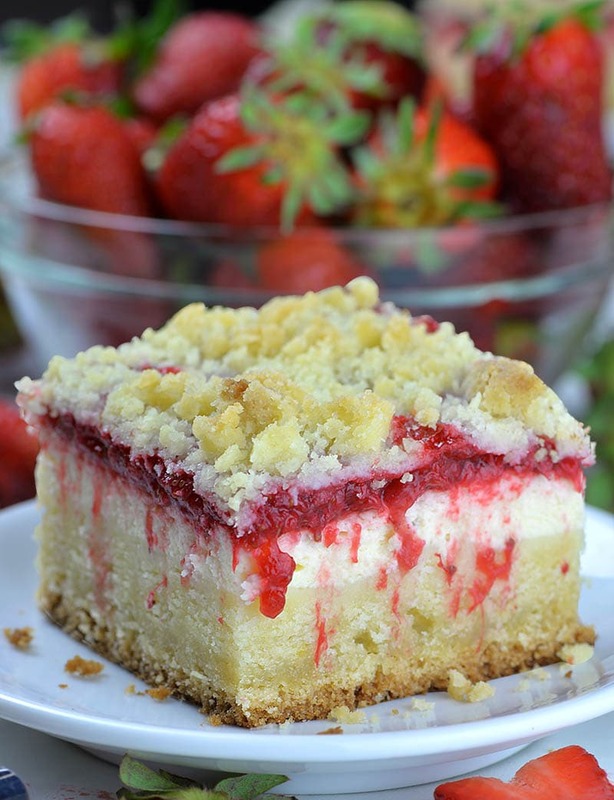 Strawberry Coffee Cake is buttery and moist, vanilla crumb cake with cheesecake and strawberry filling and crunchy streusel topping. And it’s mind-blowing texture and flavor combo!! A few years ago, I’ve made Strawberry Cheesecake Coffee Cake. And it was one delicious cake with seven irresistible layers –vanilla cake, creamy cheesecake layer, fresh, juicy strawberries, another cake layer topped with strawberries, crumb topping and sweet vanilla glaze. And this time I used strawberry sauce instead fresh strawberries and made streusel topping and cake from one simple mixture. However, I want to keep it simple and easy. A simple coffee cake is whipped together by first making a crumb mixture from flour, sugar and butter, and then mixing in sour cream, vanilla and egg. But, homemade strawberry sauce and cream cheese layer make this simple coffee cake really special and sooooo delicious! However, this Strawberry Coffee Cake is perfect choice for refreshing summer breakfast, snack or dessert,too. Actually, every single layer of this cake was amazing! 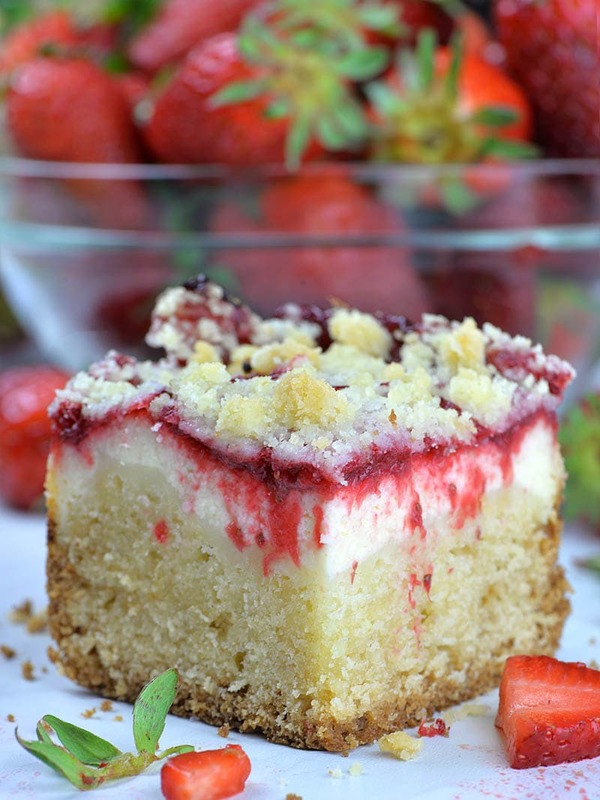 From the moist and buttery cake layer, to the cream cheese layer, to the strawberry layer and then streusel on top! And how could you not love this cake!? Moreover, I loved everything about it and it became my favorite. Definitely, I will make it again, soon! But, if you ask me, coffee cakes are so easy to make and taste amazing. Moreover, coffee cake makes perfect excuse to eat cake for breakfast or brunch. And to tell the truth, I usually pass over breakfast, but I would never skip yummy breakfast like this. Strawberry Coffee Cake alongside a cup of freshly brewed coffee is perfect way to start a day. Don’t miss this strawberry season to treat yourself with this delicious Strawberry Coffee Cake, you’ll love it, too! Strawberry Coffee Cake is buttery and moist, vanilla crumb cake with cheesecake and strawberry filling and crunchy streusel topping. It’s mind-blowing texture and flavor combo!! First make strawberry sauce. In a sauce pan combine diced strawberries, sugar and lemon juice. Stir well and cook on medium heat until strawberries release their juices and sugar dissolves. Combine water and cornstarch to make a slurry and add it to the strawberries. Continue to cook for a few minutes until it thickens, then set aside to cool. You should get about 1 ½ cups of the sauce. Preheat oven to 350 degrees. Spray 9 x 9 x 2-inch pan with non-stick cooking spray, line with parchment paper (leaving large overhang the sides), then spray the paper and set aside, too. First, in a large bowl stir together flour, sugar and lemon zest. Then, add chunks of butter and cut it in until crumbly. You can use a pastry cutter or two forks to make the coarse crumbs. Remove ¾ cup of this mixture and set aside, you will use it for topping. Next, add baking soda, baking powder and salt to the remaining crumb mixture and stir with a fork. Finally, mix in egg, sour cream and vanilla. The mixture will be thick and sticky. Spread it into prepared pan and make the sides are a half an inch up. First, beat softened cream cheese until smooth and creamy, then add sugar, vanilla and lemon juice and mix well. Finally add egg and mix until incorporated. Spoon over the bottom layer, but don’t go all over to the edges, cheesecake will burn during baking. Then, top with strawberry sauce (don’t go all over to the edges). Finally, sprinkle with reserved crumb mixture over top. Bake 45-55 minutes or until a toothpick inserted in the center comes out clean. Cool for 30 minutes in the pan, then remove and cool completely. Hi I’d love to make this, but I’d love to know if I’m a pinch can use store bought mix & double the filling and topping?